Adeliza of Louvain (also called Adela and Aleidis; 1103/1105 to April 23, 1151) was queen consort of the Kingdom of England from 1121 to 1135. She was the second wife of Henry I. After her husband's death, Adeliza gave shelter to her step-daughter, Empress Matilda, during the civil war between Matilda and Stephen of Blois for the throne of England. The daughter of Count Godfrey I of Leuven, she married the much older Henry I shortly after the death of his only legitimate heir. After Henry's death, she married William d'Aubigny, 1st Earl of Arundel, who had been a chief adviser to the king. Seven of their children survived to adulthood. Although she had remained married to Henry for nearly 15 years, they were unable to produce an heir. Her grandson, William d'Aubigny, 3rd Earl of Arundel was one of the 25 guarantors of the Magna Carta. She was a patron of the church and spent her final years at Affligem Abbey in Flanders, where she died at the approximate age of 46 or 48 years old. Adeliza was the queen consort to King Henry I of England. Adeliza was born around 1103 at Louvain, or Leuven, Belgium. Other than her being the daughter of Godfrey I of Leuven little is known of her life either before or after she married Henry I of England. She married Henry, who was the son of William the Conqueror, on February 2, 1121. Her age at the time is uncertain, although she is thought to have been somewhere between 15 and 18 years old, while Henry was 53. Henry's main reason for marrying again was his desire for a male heir. 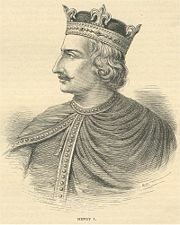 However, despite his reputation for siring the largest number of illegitimate children of any British monarch, Henry had only one legitimate male heir, William Adelin, who had died before his father on November 25, 1120 in the White Ship disaster, the year before Henry married Adeliza. Adeliza was reputedly an attractive and healthy young woman. This, together with her father's pedigree as duke of Lower Lotharingia made her a good candidate to serve as the prospective mother of a new heir to the British throne. However, no children were born during the almost 15 years of her marriage to Henry. Unlike some other Anglo-Norman queens, Adeliza played little part in the public life of the realm during her tenure as queen consort. Whether this is because of personal inclination or because Henry preferred to keep her nearby in hopes of her conceiving a male heir, is unknown. She did, however, leave a mark as a patron of literature. Several works, including a bestiary by Philip de Thaon, were dedicated to her. She is also said to have commissioned a verse biography of King Henry, but if she did, it is no longer extant. When her husband died on December 1, 1135, Adeliza retired for a time to the monastery of Wilton, near Salisbury. She was present at the dedication of Henry's tomb at Reading Abbey on the first anniversary of his death, and endowed the abbey with lands in his honor. Arundel Castle was part of Adeliza's dowry when she married William d'Aubigny. 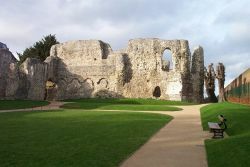 She later added apartments to the castle to accommodate the entourage of Empress Matilda, who stayed there for a time during the civil war with Stephen of England. As she was still young, Adeliza came out of mourning some time before 1139 and married William d'Aubigny, 1st Earl of Arundel, who had been one of Henry's chief advisers. She brought with her a queen's dowry, including the great castle of Arundel. The new king, Stephen of England, created d'Aubigny, Earl of Arundel and Earl of Lincoln. Although her husband was a staunch supporter of Stephen during the Anglo-Norman civil war, her personal inclination may have been toward the cause of Empress Matilda, who was her stepdaughter. When the empress sailed for England in 1139, it was to Adeliza that she appealed for shelter. She therefore landed near Arundel and was received as a guest of the former queen. The stone apartments constructed to accommodate the empress and her entourage survive to this day. Adeliza and William had seven children surviving to adulthood. All were born at Castle Arundel in Sussex, but their dates are uncertain: William d'Aubigny, (1140) 2nd Earl of Arundel; Olivia (1141); Godfrey (1143); Alice (1145); Agatha (1147); Rayner (1149); and Henry (1151). One of Adeliza's brothers, Joscelyn de Louvain (Jocelin, Gosuinus), came to England and married Agnes de Percy, heiress of the Percy family. Joscelyn may actually have been an illegitimate son of Adeliza's father and thus her half-brother. His children took their name from their mother's lineage, and their descendants include the medieval Earls of Northumberland. Adeliza spent her final years in the abbey of Affligem in Flanders, which she richly rewarded with landed estates. She died in the abbey and was buried in its church next to her father. An eighteenth century floor plan of the church shows her tombstone located halfway up the left nave. However, her grave was demolished during the French Revolution about 1798. Her remains were later reburied in the cloister of the re-erected abbey. Adeliza was a patron of literature during her marriage to Henry I and of the church during her second marriage, giving property to Reading Abbey in honor of her former husband and to several other, smaller foundations. Her son William was father to William d'Aubigny, 3rd Earl of Arundel who was one of the 25 guarantors of the Magna Carta. ↑ The Peerage—Adeliza de Louvain Retrieved July 24, 2018. History of "Adeliza of Louvain"
This page was last modified on 24 July 2018, at 15:46.